I love the great American idea of getting in a car and driving across the country, seeing things you can’t see at home, experiencing places you only read about in history books or see in documentaries you stream via Netflix. I grew up taking road trips, thanks to my missionary parents. Every summer from my 1st grade year until my freshman year in High School, my parents and my brother and sister and I loaded into whatever vehicle we had at the moment (usually something given to us by the mission board) and traveled from Seattle to Indianapolis, and then from there everywhere else. By the time I graduated from high school, I had driven (okay, mostly ridden) through the lower 48. So this is a value I grew up with, and something I am glad to pass along to my children. People think we’re crazy. Six people in a minivan, driving more than 4,000 miles across the American West. But if you don’t drive that far, you’ll never see it. You can’t fly to most of the most amazing and beautiful National Parks. And like the Pixar film Cars so aptly celebrated, if you don’t get off the highways and onto the old two-lane roads, you miss the small towns and amazing people that make America great. So tonight, I write this from a hotel in Missoula, Montana. Growing up, it was always the first leg of our summer road trip. Thanks to the amazing cooking and hospitality of John and Lydia Hirning, we looked forward to arriving in Missoula. Tonight, there was no great German cook waiting to feed my family. We made do with Cracker Barrel. (YUM.) 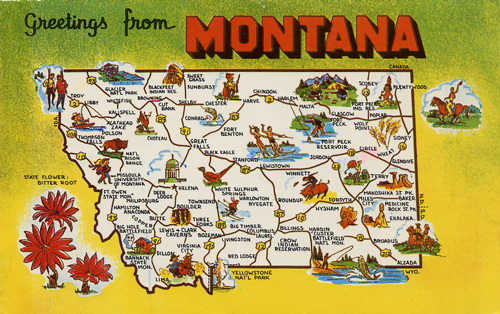 But we looked forward to arriving in Missoula tonight, probably more than I did 30 years ago. Perhaps it was nostalgia, perhaps it was the horrific amount of road work between Spokane and here that slowed traffic to a crawl, stuck behind slow-moving trucks over steep mountain passes. I don’t know. But I am so glad to be on the road again. Tomorrow we experience the first National Park of our 2010 Road Trip: Glacier, which celebrates its 100th anniversary this year. Going-to-the-Sun Road beckons! PS: If you have not yet watched The National Parks: America’s Best Idea by Ken Burns, you have missed out an amazing documentary highlighting the wonder and history of our National Parks. It’s been nominated for nearly a dozen Emmy Awards, and it’s available now for instant streaming via Netflix. Check it out.